The Marmoleum I wanted usually takes about three weeks to arrive. They send a big truck from the midwest and it travels around delivering linoleum happiness to people. With the economy in the crapper nobody was ordering flooring, so the truck was just sitting there, waiting to be filled. Three weeks after we ordered the tiles they said it would be at least another three weeks. As I mentioned before, I was brushing my teeth in the kitchen sink because my bathroom vanity was on order, and the kitchen floor was just dusty subfloor. I think it was a real testament to either 1. how much I love this house or 2. how tired I was, that this didn't make me crazy. I had waffled over the kitchen floor, wondering if I could install it myself. I had been warned that it's not as easy to install as ceramic tile, that to get the seams sealed required some skill. The Marmoleum Click tiles, which snap together like laminate flooring, would add height to the floor that I didn't want. I found out that Marmoleum comes with a 25 year warranty if you have a certified installer put it in. So I decided to spend the money to have it installed professionally. I got a ridiculous number of bids and selected A-1 Linoleum. I can't say enough good things about A-1. They were fantastic, they were honest, they were NICE. The owner split the difference of rushing the tiles out, which was about $60. Worth every penny. Having a real kitchen floor again made me feel like a princess. I love the feel of the linoleum under my feet. 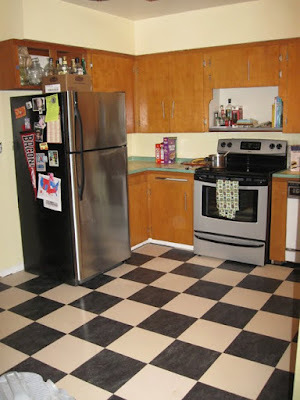 A lot of people complain about old linoleum in their apartment or house and I have to point out that they have vinyl tile, which is a totally different thing. 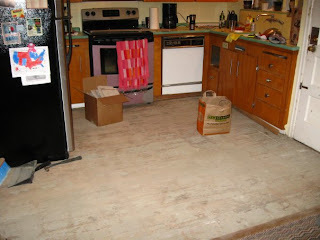 Linoleum is made of renewable materials and uses no toxic chemicals. So if I ever sell the house and the new owner doesn't like the floor (and MANY people dislike my flooring choice) they can rip it out and I don't need to feel quite as guilty if it ends up in a landfill. The only problem with putting new things in your house is that it highlights how much other things need sprucing. 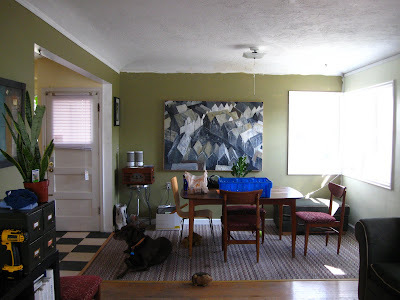 How bad does that weird carpet in the dining room look, now? Someday down the road I'll fix that . . . But for now I really really love my kitchen.